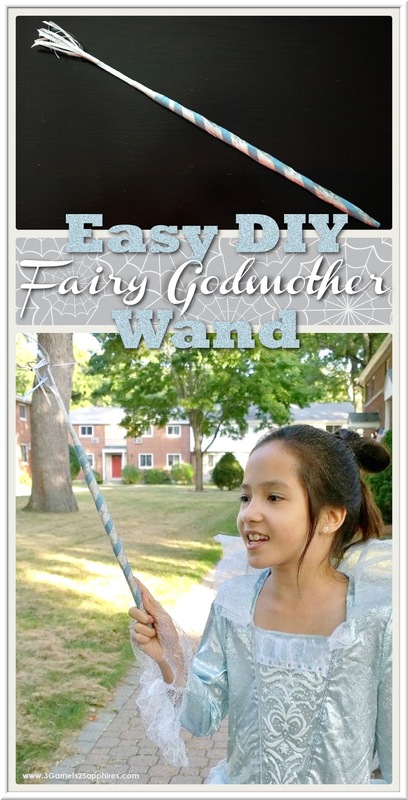 Thank you to Costume Express for providing the Cinderella Movie costume for this DIY Fairy Godmother magic wand craft feature. All opinions expressed are my own. Our 8 year old daughter has such fond memories of going to see Disney's Cinderella Movie in the theater. It was one of the few non-animated films she's watched on the big screen. In my mind, there was no question who she wanted to dress up as for Halloween this year. 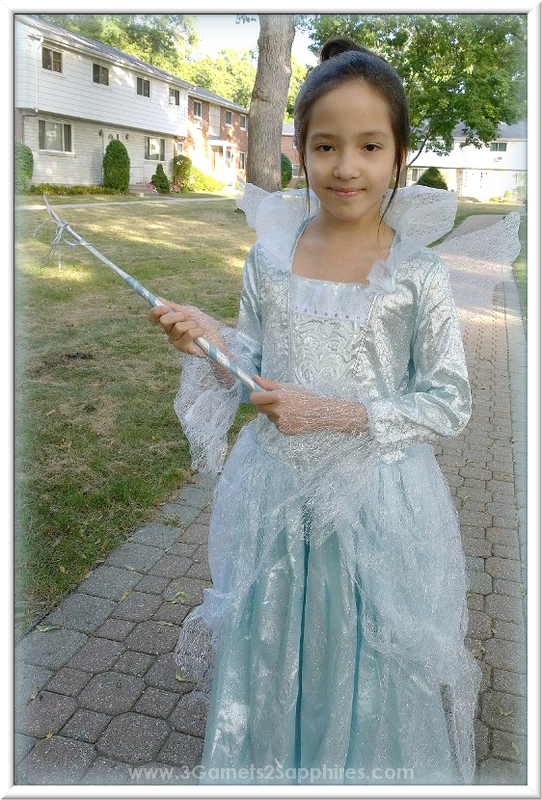 I was sure she'd want to be Cinderella, but she surprised me by opting for the beautiful Fairy Godmother instead. What a lovely sight she turned out to be, covered head to toe in glitter. 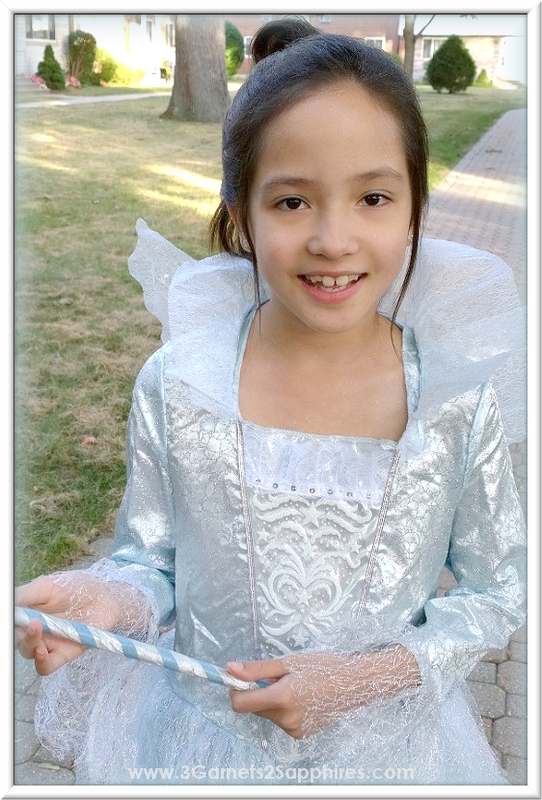 The Disney Cinderella Movie: Deluxe Fairy Godmother Costume for Girls shimmers all over in glitter dusted satin and tulle. We just added some glitter hair spray, pretty earrings, and sparkly sandals. There was just one more thing we needed . . . a wand! Step 1. Begin wrapping the streamer (silver side facing out) around the glow stick tightly at an angle. Use a little Mod Podge to keep the starting end in place, if necessary. Step 2. Leaving the top 5 inches or so uncovered, continue to wrap the streamer around the glow stick in as many layers as needed to create a rounded handle that tapers towards the uncovered tip. When the handle is the desired shape and thickness, cut the end of the streamer at an angle (as shown below) and secure with a little Mod Podge. Step 3. 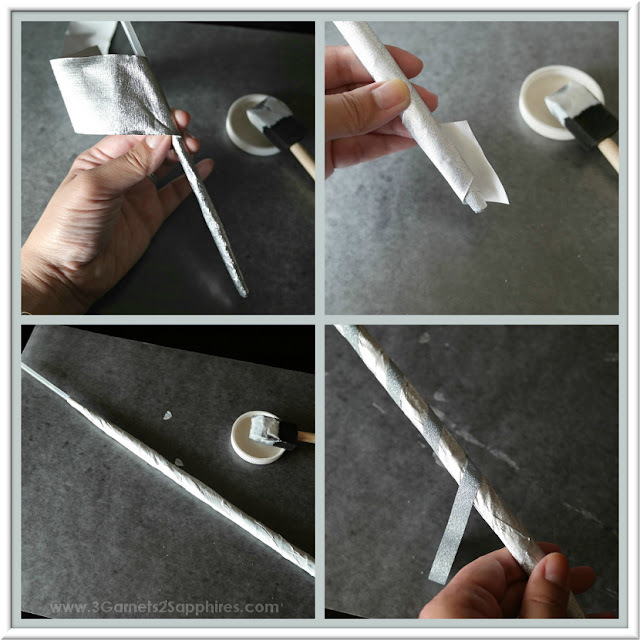 Cover the papered portion of the wand in a layer of Mod Podge with a sponge brush and allow to dry completely on a sheet of wax paper. 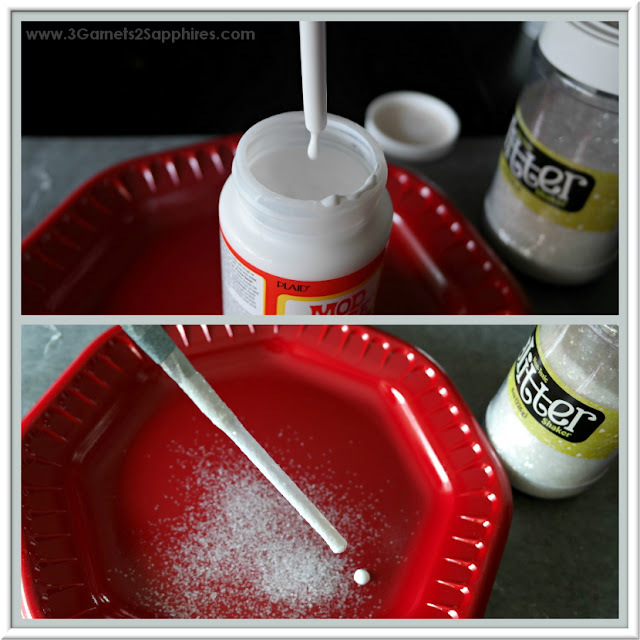 TIP #1: When applying the Mod Podge with the sponge brush, do so in a diagonal angle that follows the angle of paper wrapping. Step 4. When the Mod Podge has dried completely, wrap the glitter tape around the wand handle at an angle. Be sure the space between each row of tape is uniform. Again, leave the 5" at the tip of the glow stick uncovered. Step 5. Dip the uncovered tip into the Mod Podge, coating the tip of the wand up to the first 2 inches of wrapping. TIP #2: Be sure to hold the wand above the jar for a few seconds to allow any excess Mod Podge to drip back into the jar. Step 6. Hold the coated portion of the wand over a disposable plate. Then sprinkle glitter over the coated portion, making sure to turn the wand to get complete coverage. Step 7. Cut a segment of silver paper streamer approximately 4" long. Step 8. 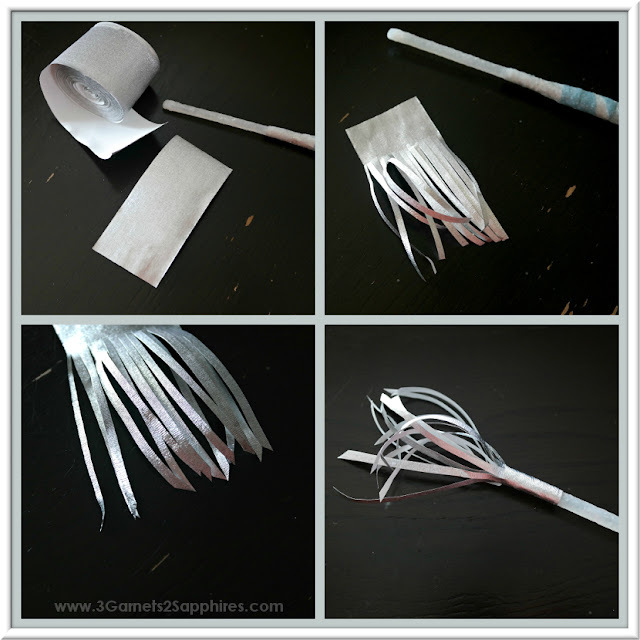 Then cut the bottom 3 inches of the paper streamer segment to create a fringe (as shown below). Then snip the end of each strand at alternating angles. Step 9. 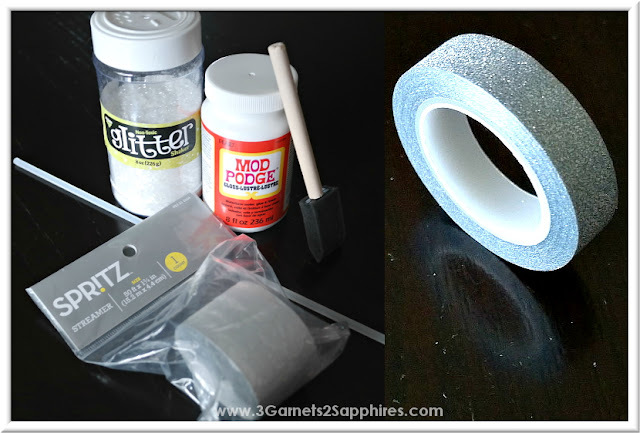 Apply a thin coat of Mod Podge to the backside of the uncut portion of the paper streamer segment. 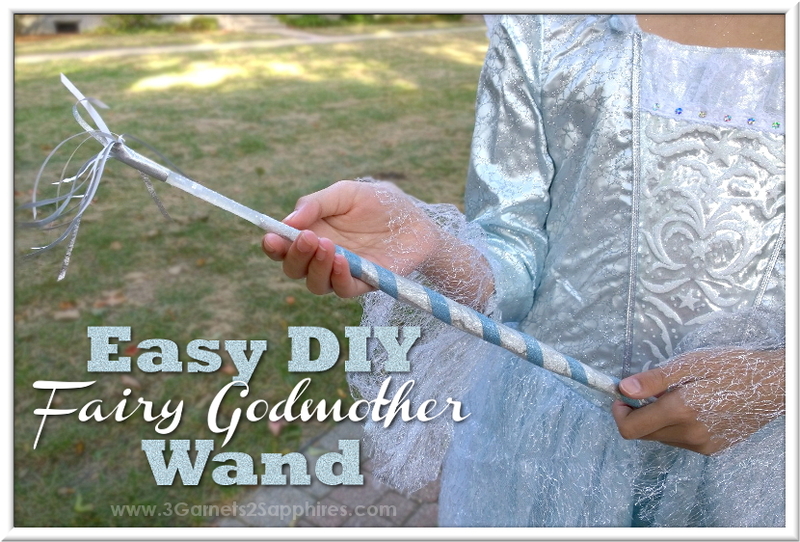 Then wrap it around the very tip of the wand, holding it securely in place until it dries. Step 10. Apply a generous coat of Mod Podge over the entire wand, except for the fringe at the tip. Allow to dry completely on a sheet of wax paper. My daughter was very pleased with how her new Fairy Godmother wand turned out. 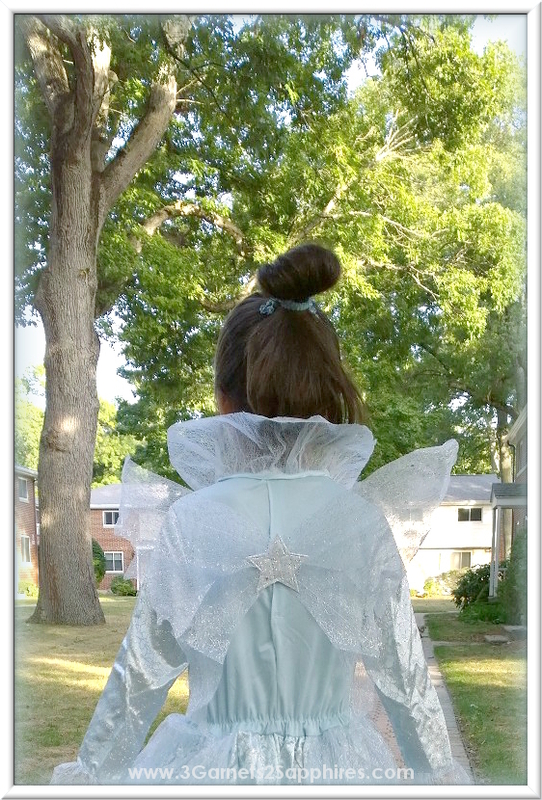 Although the wand does not compare to the exquisite details on the costume, I am pleased with the end result as well. If you have not bent the glow stick during the crafting process, you should be able shake it and bend it to make the tip glow on Halloween night. I think most Fairy Godmothers have big, bleached, side-swept hair styles, but our daughter's dark straight hair cannot do that. Hopefully, everyone will overlook her hair when they see the stunning gown. Any hair styling tips are welcome! If you like this craft idea, Pin It for later . . .
You can find the Disney Cinderella Movie: Deluxe Fairy Godmother Costume for Girls at Costume Express for $49.99. Share your thoughts about this craft with us on Facebook!